Puffling is a baby--small, white, and very hungry. Every day he waits in the burrow while his parents, Big Stripy Beak and Long Black Feather hunt for food. 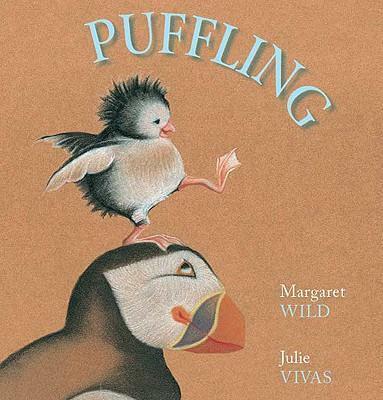 As he grows, Puffling dreams of the day when he will leave his nest and fly away--but he isn't ready yet, not until he's tall and brave enough to fend for himself. Every day Puffling asks his parents, but every day they say he must wait until he has grown bigger. Will he ever be ready to head out into the world on his own? This story about how love makes us strong, brave, and happy, too, is perfect for so many milestones: first times with babysitters, first days of school, and even graduation. MARGARET WILD is one of Australia's leading authors of children's books, and her books have sold around the world. Her many acclaimed titles include "Miss Lily's Fabulous Pink Feather Boa, "and "Woolvs in the Sitee, " as well as "Our Granny, " which was also illustrated by Julie Vivas. JULIE VIVAS is the illustrator of many well known books for children, including "Possum Magic "and "The Nativity." She lives in Sydney, Australia, with her family.